"It's Hip to Be (The New) Hollywood Squares." 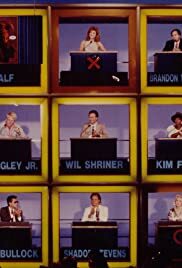 I remember the first revival of Hollywood Squares which debuted five years after the first syndicated run ended and I thought it was a more free wheeling incarnation than the original Peter Marshall version. Instead of just questions followed by comedic bluff answers, there were also musical clues as well as some celebrities cooking dinner in their square. It was also the first version of the show to go out of the studio and on the road. I remember some episodes that were taped in Hollywood, Florida and at Radio City Music Hall in New York. John Davidson, who was a guest on the Marshall version many times did an outstanding job as host. Shadoe Stevens, taking over for the late Kenny Williams as the show's announcer also appeared on camera. His brother Richard and radio personality Howard Stern also handled the announcing duties. I also remember seeing many celebrities on the show, including regular center square Joan Rivers and JM J. Bullock. Both were outstanding and really funny. The one difference I remember was the bonus round, where the winning contestant tried to win a car by picking the right key. It reminded me of Split Second and a short-lived game that was hosted by Betty White, Just Men! But this version had a much shorter run than the original, lasting three seasons. I will always remember Shadoe's host introduction "And here's your host, Johhhhhhhhhhhhhhhhhhhhn Davidson!"